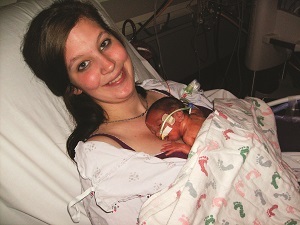 When Katelyn Neverhoven arrived at Hansen Family Hospital in preterm labor at 26 weeks the staff worked quickly to arrange her transfer to Iowa Methodist Medical Center. In the meantime, Katelyn's labor continued to progress and the Life Flight crew quickly put together a multidisciplinary team to care for Katelyn and the unborn baby. The adult crew included a neonatal transport nurse and a ground team that would be prepared to care for Katelyn's baby if she delivered. 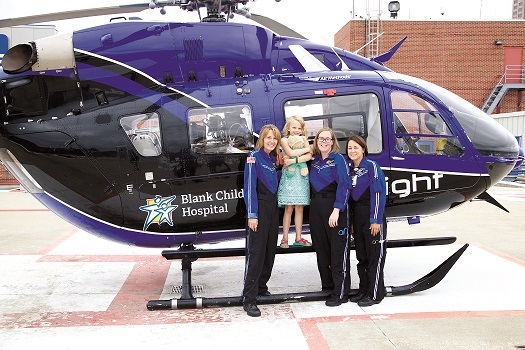 Fortunately, Katelyn's labor was stopped and the Life Flight crew was able to transfer her safely to the Iowa Methodist Medical Center maternity unit. Katelyn's delivery was held off for two days while she received lifesaving steroids to help mature the lungs of her baby. Baby Zaine was born August 1st, weighing 2lbs 3 oz. and never needed ventilator support. On December 16, 2014 7 year old Ava Broeker was struck by a car while walking home from school. Life Flight was requested to respond to Madison County Hospital. The Life Flight team includes a pediatric specialty transport nurse. Due to the critical nature of her injuries, packed red blood cells were transfused en-route to Blank Children's Hospital. Life Flight remains the only transport service in Iowa to carry blood products in the aircraft. Ava suffered a fractured skull, traumatic brain, broken arm and broken leg. After a stay in the PICU and rehabilitation, she was discharged home. As a result of the accident, a stop sign was placed at the intersection. Life Flight is happy to share these photos of Ava as the lovely young lady she is today. The transport of this patient was one of the most complex ground transports that we have ever completed. While urgent in nature, it still took nearly three hours to plan not only the transport but also the movement of the patient from the Intensive Care Unit to the ambulance. Unlike a normal transport, provisions needed to be made for additional oxygen and generator power in case there was a power failure. It took a multi-disciplinary health care team working together to successfully complete this transport. We are happy to say this patient survived because of the teams at UnityPoint Health - Des Moines working together to save this patient's life.